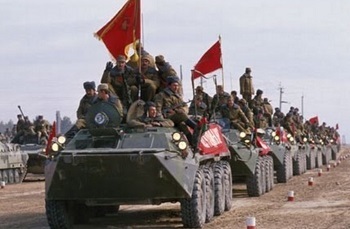 The Guardian (UK): A row has broken out in Russia over a film about the Soviet Union’s withdrawal from Afghanistan, after politicians and former servicemen criticised its unflattering depiction of Red Army soldiers as unpatriotic. Leaving Afghanistan, directed by Pavel Lungin, is based on the experiences of Nikolay Kovalyov, a veteran of the Afghan war who went on to lead Russia’s FSB spy agency. It tells the story of a group of Red Army soldiers whose departure from Afghanistan is delayed after they are ordered to free a Soviet general’s son taken captive by mujahideen fighters. Lungin told Variety magazine last year that the film depicts the “senselessness and cruelty of war”. Click here to read more (external link).